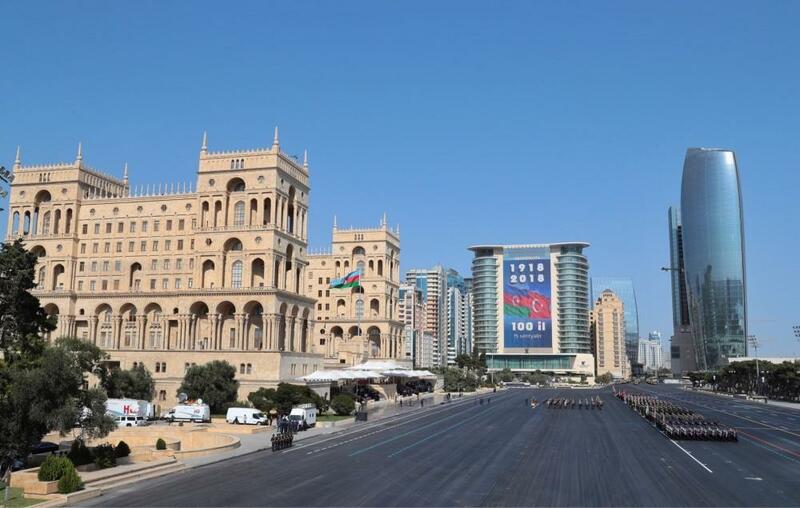 A parade to mark the 100th anniversary of the liberation of Baku has got underway in the Azerbaijani capital. President of the Republic of Azerbaijan Ilham Aliyev, President of the Republic of Turkey Recep Tayyip Erdogan and Azerbaijani first lady Mehriban Aliyeva are attending the parade. Minister of Defense, Colonel General Zakir Hasanov reported to the Azerbaijani and Turkish presidents. The heads of state saluted the soldiers. A military orchestra played the national anthems of the Republic of Turkey and the Republic of Azerbaijan. “Çırpınırdın Qara dəniz” and “Azərbaycan” songs were played. President of the Republic of Azerbaijan, Commander-in-Chief of the Armed Forces Ilham Aliyev made a speech at the parade.